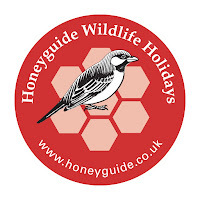 I think only Jeremy went on the ‘official’ pre-breakfast walk, though everyone seemed to be taking a leisurely stroll with various wildlife sightings as 7am neared. Female red-veined dropwings were soaking up some warmth on roadside stones and a party of violet wood-hoopoes chased each other around tree trunks. We took our time over breakfast and had the luxury of a lift back to our chalets. It was 8:30 as we drove away from Waterberg. Picnic, on the way to Namutoni Camp in Etosha National Park. There were several stops before we re-joined the main north-south road for southern white-crowned shrike, purple roller and tawny eagle. A bateleur twisted and turned as it was chased by a small bird of prey. At 9:30 we turned north towards Otjiwarongo, making steady progress until we stopped in the town for fuel and supplies from the Spar supermarket. Heading out of Otjiwarongo we passed a sign saying ‘no public urinating’, not a risk with the comfort stops Geoff plans, and nearing Etosha we stopped again at a roadside picnic table for a light picnic under the shade of spreading trees, that shade essential in the mid-day sun. We had to dodge a couple of blesbok as drew up to fortress Etosha National Park, two high fences with a no-man’s-land between them marking the boundary. The bureaucracy and picking up keys proved straightforward here at Namutoni Camp. There was a golden oriole into the trees by the chalets as Geoff explained the lie of the land. It was time for to settle in and have a break in the heat of the afternoon. At 4:30 we headed off on our first Etosha game drive. With the back seats down, everyone had a window seat and we had the benefit of our vehicles’ air conditioning. Being the dry season, essentially we went from water hole to water hole, via a mix of open scrub and grassland plus dry saltpans. Darrin’s bus, which I was in, took a brief detour to see a party of elephants, but there were several vehicles there so we didn’t linger. There was a fine selection of small birds at the first stop, with scaly-feathered finch especially numerous, though you had to see them in the right direction to see the black malar stripes. Great sparrow was much more striking than the picture in the book, and I was struck by the angular shape and large size of the beak of a female red-headed finch. There were pale chanting goshawks at the first two water holes, but the small birds carried on feeding regardless. 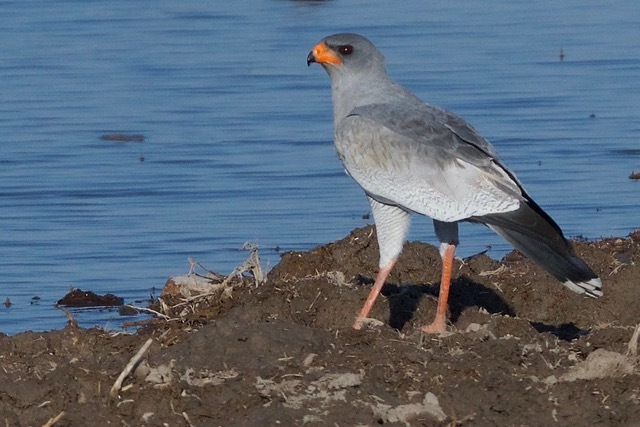 Pale chanting goshawk (Cheryl Hunt). We paused on the road through the grasslands by the saltpans as a steady stream of perhaps 60 zebras came through, large and small. Then both buses left the camp gate to find the final water hole. 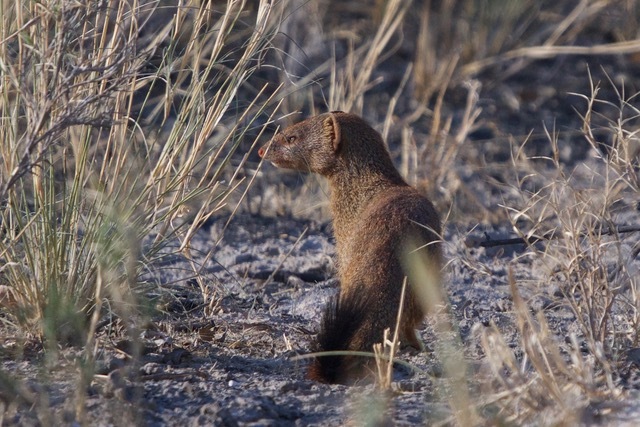 Our group paused as a slender mongoose ran across, long tail waving in the air and settled in the shade behind a bush. The final waterhole had a fine selection of waders including greenshank, wood sandpipers, black-winged stilt, three-banded plover and a flock of ruffs. Our bus added marsh sandpiper to that list and Geoff’s group Kittlitz’s plovers, a distant group. Three giraffes grabbed our attention, naturally. On the way back, Geoff’s group saw kori bustard, ours Swainson’s spurfowl. We all saw a close black korhaan. A straw poll in my bus gave slender mongoose, zebras, great sparrow and pale chanting goshawk as highlights of the outing. The water supply was back on in the chalets when we returned and it was soon time for our buffet dinner taken in the open air outside the restaurant. A fork-tailed drongo hunted moths by a large light on the roof. Many called briefly at the waterhole after dinner where two rufous-cheeked nightjars were illuminated as they hunted over the marsh. Northern black korhaan (David Bennett).